Kaladlit Okalluktualliait. kalâdlisut kablunâtudlo... Grönlandske Folkesagn, opskrevne og meddeelte af Indfodte, med dansk Oversaettelse.. Godthab, Greenland: Rasmus Bertelsen & Lars Moller (vols.I-II) and Lars Moller (vols.III-IV), 1859-1863. 4 volumes, 8° (199 x 126mm). Parallel titles and text in Inuit and Danish, vol.II with 1 sub-title printed in red. 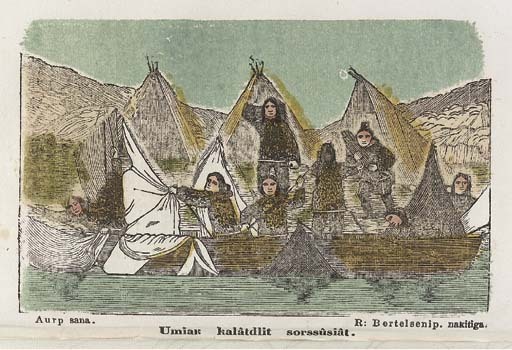 Inuit title to vol.I with hand-coloured wood-cut decorations, Inuit titles to vols.II-IV with wood-cut vignettes. 46 plates (12 lithographs, 34 wood-cuts by Arup of Kangeq and others [12 of these hand-coloured or colour-printed]), 2 folding lithographic and letterpress maps, 8pp. of lithographic sheet music. Later half calf gilt, gilt edges (spines slightly faded). Provenance: K.S. (initials below the figure for Capricorn, blocked in gilt on front pastedowns).